Use the Shipping Policy as a starting services policy for your web site. This policy is used to describe the various issues related to shipping goods that customers need to be given when they are placing their order. This Shipping Policy is included in editable Word format that can be customized in Word or by using the included Wizard software. This policy is intended to be used as a starting services policy template for online use. Edit as needed for each specific web site and integrate the text into the web site HTML code and reformat as needed. Our shipping policies appear below. Most orders placed before 12 P.M. EST will be processed and shipped on the same day. Orders placed after 12 P.M. EST may be processed and shipped on the next business day. Confirmations of orders and shipping notices will be sent to the customer via the email address entered on the order form. Order confirmations will include a copy of the order, availability status, and if already shipped, tracking information and expected delivery date. Orders for products not immediately available will receive a confirmation of order that includes a notice of approximate availability. When the order is shipped, customer will receive a shipping notification. Large orders requiring oversize or multiple packages may result in additional shipping charges. Customer will be notified of these charges when order is confirmed, and may cancel the order or approve the charges before shipping. Customer will be billed at the time of shipping. All credit cards are verified before shipping. Orders will be shipped via USPS, UPS, or FedEx, depending on the type of shipping selected by the customer. All orders require a physical address; we cannot deliver to P.O. boxes or APO/FPO addresses. All expected delivery dates are estimates. Actual delivery dates may vary due to weekends, holidays, or unexpected schedule disruptions. Customers may be charged sales tax as required by applicable laws in different jurisdictions. Sales tax charges will appear on the order confirmation, and customer may cancel or approve the order before shipping. Regulations may prohibit us from shipping some items to specific locations. If an item is prohibited from shipping to the customer's residence, customer will be notified at the time of order and the order may be cancelled or modified at that time. All orders leave our warehouse in perfect condition. If an order is damaged in shipping, customers should contact the shipping company to make a claim. All shipping costs on returned items will be paid by the customer. 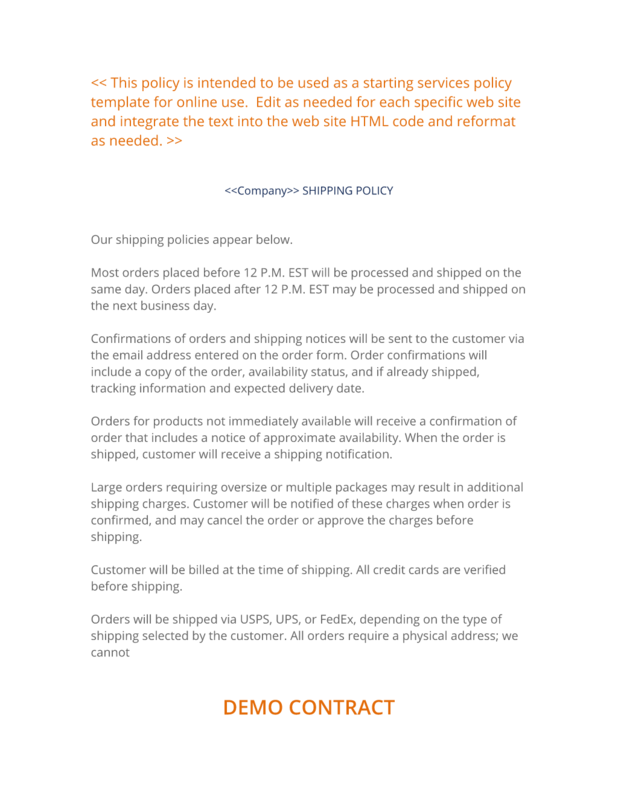 The complete Shipping Policy - with the actual formatting and layout - is available in this Contract Pack.